What Makes a Killer Backyard BBQ? There’s nothing more American than gathering around the grill on a warm summer day and entertaining family and friends with tons of grilled meat. This summer host the ultimate killer backyard BBQ with these tips to make it the party of the year. One feeling that a backyard BBQ evokes is friendship and camaraderie. Invite the right mix of family, friends, and neighbors and let them know their friends are invited too. Backyard BBQs are a great time to meet new people, especially since it’s not likely they’ll be spending too much time inside of your home. When’s dinner? Who knows?! Set a time for people to show up but let everyone know that the meat is coming out whenever it’s ready and your yard is open until you shut it down – which, with the right crowd could be late into the night. This is especially true if you’re working with one smaller grill, since there’s only so much meat you can cook at once. Ask people to bring side dishes or drinks and plan on having a lot of foods that can sit out for a while without going bad. If you’re providing side dishes or desserts, make them the night before. Also, start marinating your meat at least 24 hours before you grill to ensure maximum flavor. Make lists of the types of meat you have and how long it should be grilled; use this as a cheat sheet in case you get caught up chatting with friends while grilling. Finally, grab all your grilling utensils and trays so you’re not searching once your meat is on the grill. Check your charcoal or gas to make sure you have enough on hand, even buy some extra just in case you grill more than you expect. About an hour before your guests are slated to arrive, heat up the grill to ensure it’s nice and hot and ready to go once people start filing in. Some people like to fly by their seat and ask guests to bring their own meat to the BBQ. If you’re taking that approach, be sure to understand the time it takes to cook. Otherwise, plan your menu accordingly and keep it relatively simple. If you’re expecting a large crowd, think of sticking to burgers and hot dogs to keep the food flowing quickly from the grill to the plate. 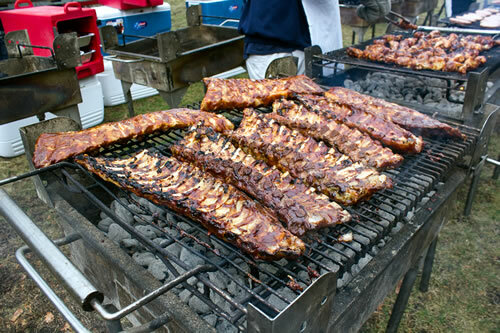 Or, consider having your BBQ catered so you can enjoy the party too! Be sure to consider the amount of meat you’re buying. If you have leftovers, they can be refrigerated and then you won’t have to worry about dinner during the week. Any uncooked meat can be frozen and brought out any other time. One of the easiest ways to ask your guests to contribute is to have them bring a 6-pack to share. Not only does this bring down the costs for you as the host, but it also ensures a steady flow of beer coming in as the day goes on. Invest in some heavy-duty paper plates to handle the heavy meat and any sides your guests pile on. Also, be sure to leave a few garbage cans around the yard to ensure the trash makes it to the bin, thereby lowering your clean-up time later that night. The easiest way to make a killer backyard BBQ is to plan a little and go with the flow. Enjoy spending time with your family, friends, and loads of meat. Thinking about having your BBQ catered? Contact Woodman’s today for more information. https://woodmans.com/wp-content/uploads/2018/11/woodmans-logo.png 0 0 competenow https://woodmans.com/wp-content/uploads/2018/11/woodmans-logo.png competenow2018-05-30 08:00:432018-05-30 08:00:43What Makes a Killer Backyard BBQ?